Old Nesebar is a small ancient town on the coast of the Black Sea in Bulgaria. One can walk from one end to the other in an hour. It is a town which keeps a vast number of monuments from different times, some of them preserved as far back as antiquity. The town is connected with the mainland by such a narrow neck that it is practically an island. That’s why the houses in Nesebar were built in two stories to save precious space. The first story is made from stone and the second is wooden, overhanging the tight streets. The roofs are covered by the characteristic red and orange tile of this area, which is especially expressive when it is old and crooked, covered by moss and splits. Huge roses are planted on the balconies, which glow like lamps, letting the light through. The streets between the houses are paved with cobblestones, while by the sides there are shops with ceramics and antiques. Some of the gift shops exhibit painted plates. Most of them are covered with bright, colorful glaze, which miraculously combines in a geometric ornament. But in some shops one can also find plates covered with the finest paintings. Their bright and wonderfully harmonious colors and the intricate shape of the ornaments are attractive to look closely. When you approach and begin to examine them, the shopkeeper floats over to you and with a mug of hot herbal tea allures you to look at all the things in his shop. Every such plate is a real work of art. A subject for a painting you can find there, probably, on the every street: the orange roofs and the blooming balconies, the white walls and the colorful spots of glaze. I could have spent all my plein air time in Bulgaria there, but I only had one day to spend on the picture. I found a spot from which I would paint on a street so tight that a car could hardly squeeze through it. 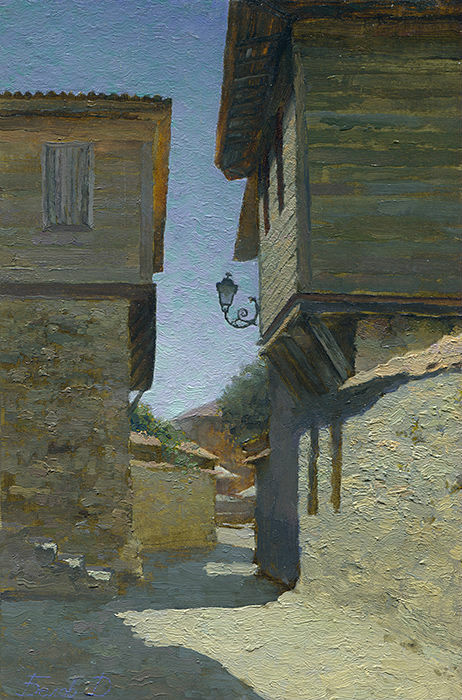 In just a day I would depict the wood and the shadows falling on the street, sharply contrasting with the stone, warmed up by the sun and the southern heat in the narrow streets of the ancient town. It is good that the overhanging stories of the houses provided me with shelter from the sunshine, which unceremoniously boiled the town. The shadows slipped down by the walls, crawling to the road, exposing the wood and the stone to the sun. The heat began to radiate from the walls and ground. But despite the fact that I had to move, following my shelter, I managed to practically finish the whole work in time.